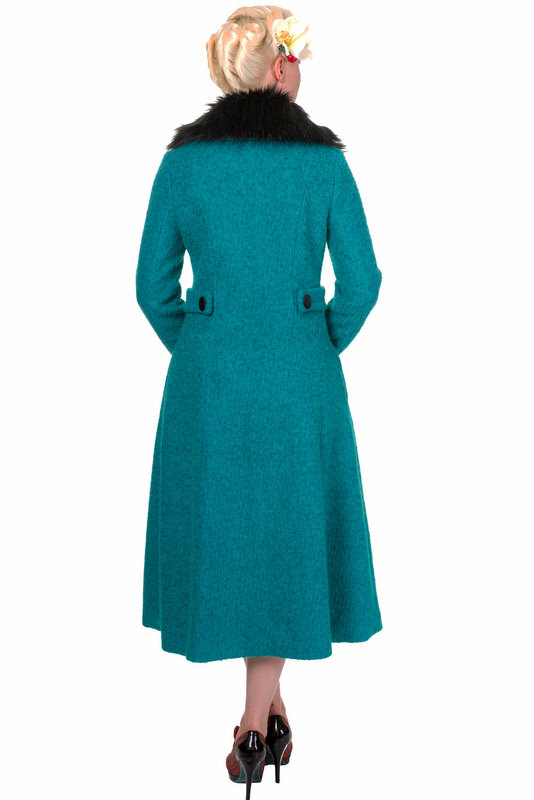 Say hello to the Banned By Dancing Days Simple Game Emerald Winter Coat in UK Sizes 8-22. This cool cover up coat boasts a sensational 1940's/50s timeless vintage style in an amazing emerald green shade. Join the ranks of Dancing Days fans who know how to work a statement coat like this, as it promises to transform your look with a vintage twist, with classic styling and presence, and capture the romantic air with this Banned By Dancing Days Simple Game Emerald Winter Coat. Offering a figure flattering cut, which has a fitted snug bodice, with a full length flared hemline, teamed with decorative satin buttons that form the single breasted fastening. To the waistline, side panels form the illusion of invisible side seam functional pockets which streamlines this number to an exciting vintage gem! Side seams run down to the front and back of the coat with contrasting black buttons to the reverse. This distinctive coat promises you all the head-turning style your heart could desire! This long sleeve coat boasts long sleeves creating volume and debonair, side seam workable pockets and gently flares to the hem with a slight kick! Crafted from a superb quality fabric comprising of a Polyester / Wool mix in emerald green, and fully lined for comfort. Practical and incredibly stylish, and bound to incite admiration. We just know that this is the coat to make you look and feel romantically dramatic. Banned Apparel London, is the British Retro-Repro brand that is famed for vintage innovation at must-have prices. They craft the most figure flattering designs from to-die-for prints that are guaranteed to please and appease your vintage passion! That's why we love Banned Clothing, and we're certain that you will too! Super fast delivery, coat exactly as described and absolutely stunning! Great coat and quick postage. Thank you very much! Absolutely Beautiful item, so warm & comfy that arrived very quickly! 5 star! 13) "Item is perfect :-)"
14) "Made a special lady very happy"
Great quality, different to what I could find on high street.